He loves me so much, and its not because of my cake! 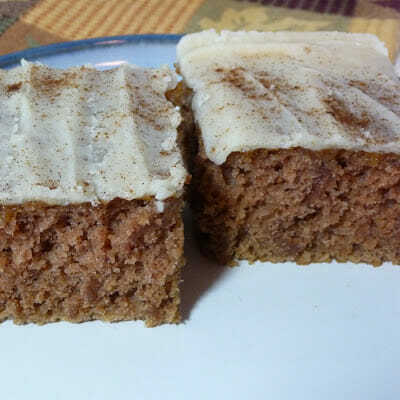 I wouldn’t eat spice cake of any kind when I was a little girl. I wanted my chocolate mayonnaise cake and that was that. I didn’t want anything BUT chocolate mayonnaise. When my Nanny would ask me what kind of cake I would like her to make me for my birthday, it was always chocolate mayonnaise, please. I’m go glad that as an adult that my horizons have been broadened and I will eat try other types of cake not just chocolate mayonnaise cake! One thing I finally tried a few years ago was browned butter. The first time I ever had it I used Cooking Light’s Roasted Asparagus with Browned Butter Sauce. I fell in love. Since then, when I see something that calls for browned butter, I know it has to be delicious. Therefore, I just knew this cake was going to be awesome. Not only did I love the flavor, but it was super moist! I’m going to test one of my readers here. I warned our package delivery man that I might mention him in my blog. He told me today he checks it out to see what I made (and I think so he can crab at me that he didn’t get any!). I said to him, “so you read about my boring life to eh?” His response? “Oh, I didn’t know I was supposed to read, I just look at the pictures!” ha ha. Well, because Scott comes in and gripes about not getting any of the food I bring into the office, I am taking in a piece especially for him tomorrow. Then he can quit his griping! Hope you enjoy it Scott! **it is important to use butter in this recipe as it is the browned butter that gives this cake the wonderful flavor! Please don’t substitute margarine…..it won’t be the same! Heat oven to 350. Spray 8-inch square pan with cooking spray. In 1-1/2 quart saucepan, melt 1/3 cup butter over medium heat. Cook 2 to 2-1/2 minutes, stirring occasionally, until butter just begins to brown. Immediately remove from heat. Stir in granulated sugar, applesauce and vanilla. In large bowl, mix flour, baking soda, cinnamon and salt. Stir in applesauce mixture. Pour into pan. For the glaze: In 1-1/2 quart saucepan, melt 2 tablespoons butter over medium heat; cook about 3 minutes or until butter just begins to brown. Immediately removed from heat. Stir in remaining glaze ingredients until smooth and spreadable. Pour over warm cake. Cool 30 minutes. Serve warm. This makes 9 servings. 300 calories per serving, 10 fat grams, 25 mg cholesterol, 340 mg sodium, 51 carbohydrates, 1 gram fiber, and 2 grams protien. I love that picture! Your cat is too cute and I don’t think you look like a dork – I think you look beautiful! But this cake, now this is serious business…yum. That it the cutest picture ever!! I’ve never had a cat 🙁 My husband’s not a cat person. The cake looks delicious! Rudy is adorable. Fabulous cake. Love the flavor combinations! I am going to try this cake. 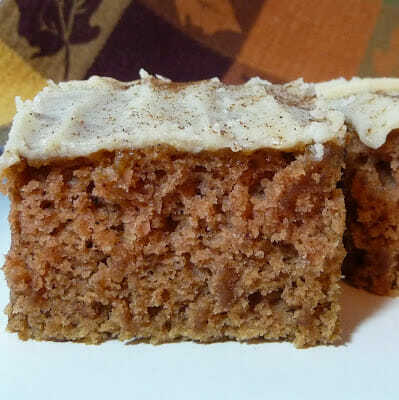 I love spice cakes and this one looks so moist. Oh yum. That cake looks great and so very, very moist. And LOVE kitty! So silly. What a precious kitty!!! It’s so sweet that he loves you so. I usually just make chocolate cake…but I really should be more adventurous. Your cat is a sweetie! 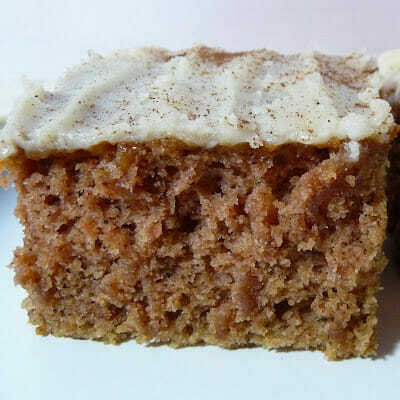 The spice cake looks so moist and delicious. I am in love with anything that has to do with brown butter too. Cute picture of you and Rudy! The cake looks yummy. That cake looks delicious! Love your cat!! He’s so cute asleep like that! My cat tends to sit on my lap a lot more in the winter than she does in the summer… So strange! Do I have to wait ’til after lunch? Because I’d like one-two pieces right about now. Delicious post! Now that’s a piece of cake. The glaze sounds AMAZING! I am sure Scott will love it. WOW – that sounds like a truly scrumptious cake, and so perfect for fall! Delicious-looking cake!! Can’t wait to try it out. And I LOVE my cat too! She greets me at the door every day I arrive home and sleeps at the foot of my bed and nibbles on my hair that gives me a great head massage! Gotta love it. My Indiana Jones (yes that is my cat’s name!) is the same way. He is glued to my hip 24 hours a day. He lays on my desk, my lap, my keyboard and always manages to be in my way…but he’s my baby so I put up with it. 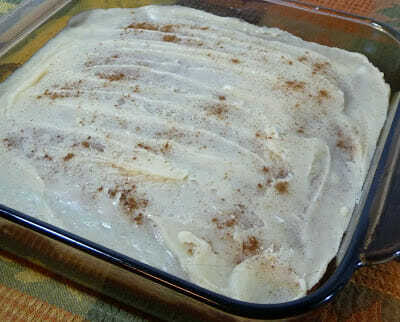 Butter rum applesauce cake sounds divine! Looks good – and looks soooo moist! Oh my, does that ever sound delish! It looks so nice and rich too. Cute cat! He looks like my old beloved cat. Yummy! That pic of you and your cat is so funny. How did you keep working? I have been going brown butter crazy over at my blog too. It is the best isn’t it? I had to look twice at the kitty. At first I thought it was a pretty scarf. Ok Ok I’ll get glasses! Butter makes everything better but even more so with browned butter, YUM! You cake looks scrumpdillyumptious! (did I spell it right?) LOL! I have to try this cake….I love anything w/ brown butter too. That asparagus recipe is a favorite…everybody loves it! And how cute is your kitten? Thanks for putting my blog on stumbleupon, Shelby…you’re so sweet! Funny kitty! Your cake looks good. I used to love chocolate mayonaise cake when I was a kid also. Oh Rudy is so adorable, I am sure he loves you so much! I never heard of Mayonnaise cake before, I thought you were joking, then I check the link…wow now I believe you. I just couldn’t imagine how its taste. I take your word for it! My pug likes to stand on me. I think she is part mountain goat. She isn’t so small and light as your kitty though, nor as graceful, I imagine. Oh my gosh! That is such a priceless photo of you and kitty!! I love it. And the cake! I’m going to put that on my list to make. It looks fabulous. Could Rudy be any cuter? Reading this recipe may induce drooling. Please take standard precautions.